Alvechurch prepare to compete in a new league for 2018/19. 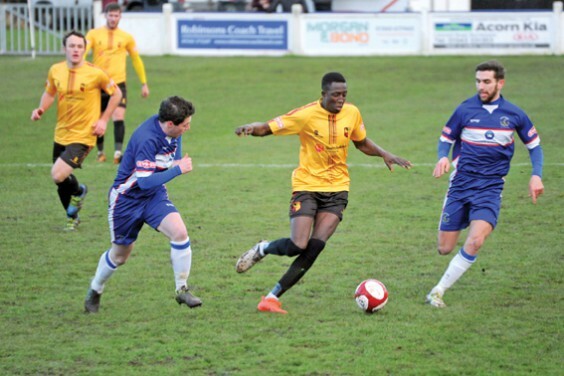 In the wake of Alvechurch FC’s promotion-winning season, midfielder Babucar Sauane has been selected to attend the prestigious V9 academy this summer. The V9 academy is the brainchild of England and Leicester City striker Jamie Vardy, with the aim of discovering non-league talent and promoting players to the professional game. The five-day residential programme takes place at City Football Academy, the training complex of Manchester City FC, and will also be filmed as a Sky Sports documentary. Meanwhile, the club has been celebrating last season’s success with the Player Awards 2017-18. The winners were: Players’ Player – Ashley Carter; Manager’s Player – Zac Foster; Supporters’ Player – Tom Turton; Chairman’s Player – Yusifu Ceesay; Young Player – Luke Yates; Top Scorer – Josh March; Goal of the season – Daniel Dubidat. * As Alvechurch prepare to play in the new Southern League Central Division next season, the club has made a number of new signings. Kieran Cook follows Luke Yates to AFC from Wednesfield FC and will add extra pace to the side as an attack-minded player. Danny O’Callaghan, who can play in defence or midfield, has played for both Coleshill Town and Sutton Coldfield Town so brings plenty of experience to the squad. Mamoke Akauna, a strong forward with plenty of pace, actually scored against Alvechurch in the league last season when playing for Carlton Town. Dominant defender Kyle Morrison has returned to Lye Meadow where he started his career. For the past three seasons he has been ever-present in the Halesowen Town defence, and brings plenty of experience playing at step 3 level. Midfield powerhouse Mitch Botfield, whose strength and tackling ability played a significant role in last season’s success, will be staying at the club, along with Nathan Waite. Nathan’s goals were vital last season and his goals per minutes played ratio were the best in the entire squad. However, right back Jamie Ashmore has decided to leave the club to seek pastures new. Also leaving is goalkeeper Lewis Gwilliams, who played 15 matches for Alvechurch last season. Lewis has decided to join Midland football league side Worcester City, who ground-share at Bromsgrove Sporting. * The club is offering fans the opportunity to sponsor their favourite Church player in the new season. All sponsorships will contribute to the player budget, so the more you can contribute the better! Players can be multi-sponsored so it doesn’t matter if someone else has sponsored them already. It’s entirely up to you who you sponsor and for how much. For example: 38 weeks @ £5 per week is £190, or £10 per week is £380. However, every contribution helps. You can pay per week by standing order or up front in advance. Payments can be made direct to the club’s account (sort code 30-96-97, account 01860704; Reference: Player Sponsorship – Name). * AFC has announced its admission prices for the new season: (League/League Cup/FA Comps) Adults £10; Over 65s £7; Juniors (13-17) /Students (with ISIC Card) £5; Under 13s FREE (with a paying adult). Season Tickets (League games only): Adults £150 (saving of £60); Over 65s £100 (saving of £47); Juniors (13-17) / Students (with ISIC Card) £75 (saving of £30). Note: Season tickets will NOT include cup games, but holders will receive discounts for cup matches. Pay for your season ticket online by clicking on Website Payments.